Internationally renowned expert Professor Chris Pollitt shares his knowledge to aid accurate diagnosis and effective treatment of equine foot problems. 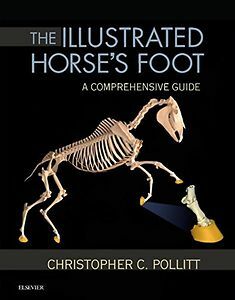 The Illustrated Horse’s Foot presents 1,000 of the highest quality images from the author’s collection, including many 2D reconstructions of MRI and CT data. Building on the success of Professor Pollitt’s Color Atlas of the Horse’s Foot, this illustrated text augments a unique photographic collection with accompanying text offering information on clinical signs, diagnosis, treatment and prognosis in a templated format for quick and clear access. The Illustrated Horse’s Foot comprehensively covers a wide range of equine foot conditions and includes access to an ancillary website presenting not only a generous image bank but video clips and 3D images of MRI and CT data. It is an essential guide for all equine veterinarians and farriers.